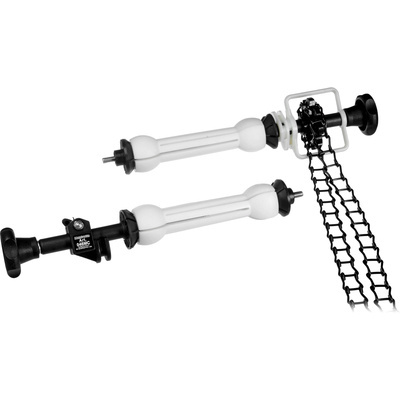 Product #17189 | SKU 046MCB | 0.0 (no ratings yet) Thanks for your rating! The Manfrotto 046MCB Expan Drive Set with Black Metal Chain allows easy raising and lowering of rolls of background paper without lowering the support stands. The system uses two expandable technopolymer inserts to support a single roll of seamless paper. Tightening each side expands the drive inserts from 4.6 cm to 7.62 cm to grip the roll solidly from the inside. One side has a large toothed gear to which a metal link chain affixes, permitting convenient raising and lowering of the background paper roll. The other side has an adjustable tension drag.